Jacks or Better Farm’s Awesome Banner is scheduled to face nine rivals in Saturday’s $250,000 General George (G3) at Laurel Park with an opportunity to join the Thoroughbred millionaire’s club with a victory in the seven-furlong sprint, one of six stakes carded on a program headlined by the $300,000 Barbara Fritchie (G2). The Ken Decker-trained multiple graded-stakes winner visited the Laurel Park winner’s circle following his most recent start in the $100,000 Fire Plug, in which he was pace-involved throughout the six-furlong dash and prevailed by a half-length. The Jacks or Better homebred had more than held his own against many of the best sprinters in the country, with whom he was graded-stakes placed in five consecutive stakes shortly after joining Decker’s Mid-Atlantic-based stable. The 5-year-old son of Awesome of Course finished second behind Imperial Hint in the Smile Sprint (G3) at Gulfstream, came in second behind El Deal while finishing ahead of Limousine Liberal in the Alfred G. Vanderbilt (G1) at Saratoga, and fell a nose short of holding off Whitmore in the Phoenix (G2) at Keeneland. He also finished third behind Whitmore in the Maryland Sprint (G3) at Pimlico and was placed third behind Chublicious in the De Francis Memorial Dash (G3). “He’d been running against tough competition all summer. He got a very good trip in the Fire Plug and ran a good race. He came out of the race in excellent shape and has been training back really well,” Decker said. Awesome Banner’s triumph in the Fire Plug was his first in 13 starts since he captured the Florida Sire Stakes Foolish Pleasure at Gulfstream Oct. 1, 2016. Attaining millionaire status seemed to be well within Awesome Banner’s reach after winning his first three starts, including two graded stakes, by a combined 19 ¼ lengths. After breaking his maiden and the Gulfstream Park track record for 4 ½ furlongs with a 9 ¾-length romp in his debut in June 2015, the Florida-bred colt was sidelined for seven months. He came off the shelf with a 4 ½-length triumph in the six-furlong Hutcheson (G3) at Gulfstream in January 2016. Four weeks later, he drew off to a five-length victory in the seven-furlong Swale (G2). His connections put Awesome Banner on the Road to the Triple Crown, but he didn’t fare well in two-turn starts in the Fountain of Youth (G2) and the Tampa Bay Derby (G3). Back in one-turn competition, he won three stakes and finished second in the Carry Back (G3) at Gulfstream during his 2016 season before joining Decker. J. D. Acosta has the return mount. Jacks or Better Farm’s Fellowship was also entered in the General George after scoring a late-charging victory in a six-furlong optional claiming allowance at Laurel Park in his most recent start. The 5-year-old son of Awesome of Course is not nearly as accomplished as his stablemate, but the homebred colt has earned more than $680,000, including the $300,000 winner’s share of the $500,000 purse he collected in the 2016 Florida Sire Stakes In Reality. Decker doesn’t have to be concerned with Fellowship and Awesome Banner getting in each other’s way. “It should be one catching the other. It gives them both a good opportunity to win the race,” said Decker, who awarded the return mount aboard Fellowship to Steve Hamilton. R. Larry Johnson’s It’s the Journey and Stronach Stables’ Something Awesome, who finished second and third, respectively, behind Awesome Banner in the Fire Plug, are set to challenge Awesome Banner again in the General George. The top three in the Fire Plug all were within a length of each other. Bruce Golden Racing’s Great Stuff was entered in the General George for a quest to win his second straight graded-stakes victory. The David Jacobson-trained 6-year-old son of Quality Road overcame a troubled start in the seven-furlong Toboggan (G3) at Aqueduct with a late kick that carried him to a 2 ½-length victory Jan. 27. Jockey Dylan Davis is scheduled to travel from New York to accept the return mount. Do Share is set to make his graded-stakes debut in the General George after winning seven of his last 10 starts. Trained by Linda Rice for the Estate of Anthony Miuccio, the 5-year-old gelding is coming off a late-closing triumph in the six-furlong Gravesend over a sloppy Aqueduct track Dec. 23. New York-based Manuel Franco is slated to ride Do Share for the first time Saturday. 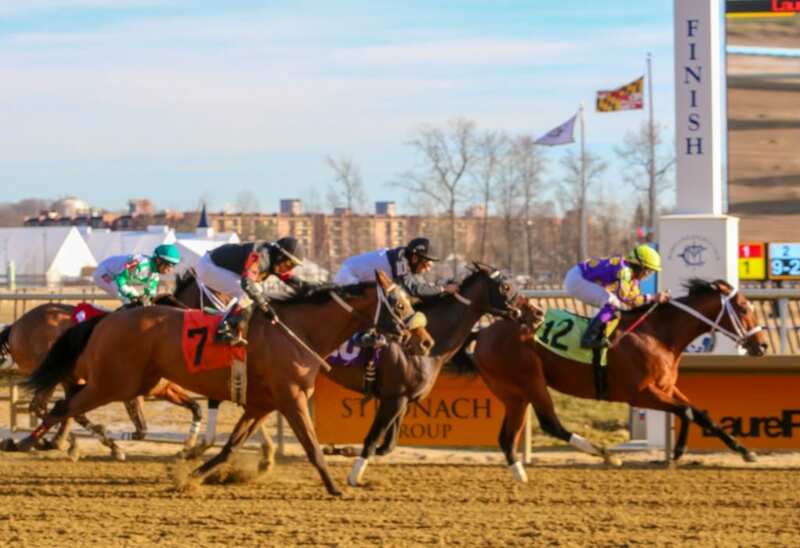 Michael Scheffres’ Ballivor, who produced back-to-back allowance victories at Laurel, and Morris Kernan Jr.’s Cowboy Mz, the winner of back-to-back allowances at Parx, will try to step it up in graded-stakes company. Sonny Inspired and Grasshoppin round out the field.